This awesome list of the 25 best chain restaurants for gluten free dining is the only resource you’ll ever need for safely eating out gluten free! Not only do these restaurants offer a gluten free menu, but they’re also celiac friendly. 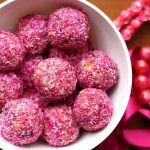 This list includes gluten free fast food restaurants and sit down restaurants chains, so you can find exactly what you’re looking for! Enjoy safe and delicious gluten free options anywhere in the USA! When you’re allergic to gluten, eating out can be a challenge. It’s hard enough just avoiding obvious gluten without also having to worry about cross contamination too. This list of the 25 BEST Chain Restaurants for Gluten Free takes the guesswork away, so you can confidently enjoy a safe gluten free meal without the worry! 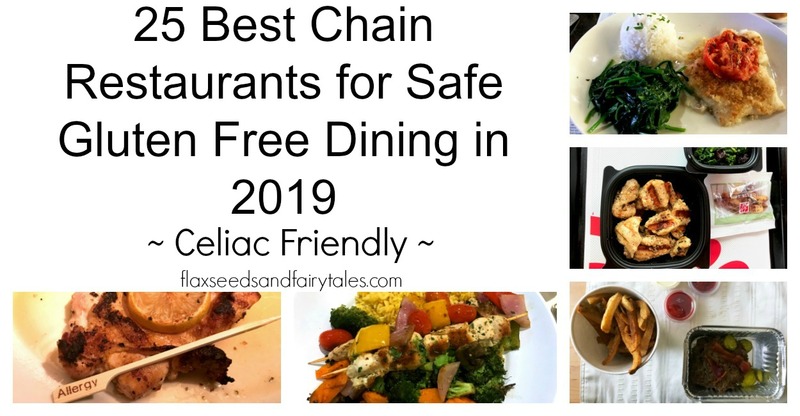 I’ve personally researched and eaten at every single restaurant on this list– I’ve even spoken to managers and corporate where necessary to make sure these chain restaurants are safe for celiacs! Important Note: These recommendations are based on my personal experience only. For your own safety, please remember to always check with the restaurant for your individual needs. I make no guarantees about presence of gluten or cross contamination. While I try to keep this post up-to-date, restaurant offerings could change at any time and individual locations may vary. These restaurants all serve gluten free meals, but are NOT dedicated gluten free facilities and do use gluten on the premises. If you have a serious gluten allergy, remember to always dine at your own risk and speak to a manager when ordering. See full health disclaimer here. 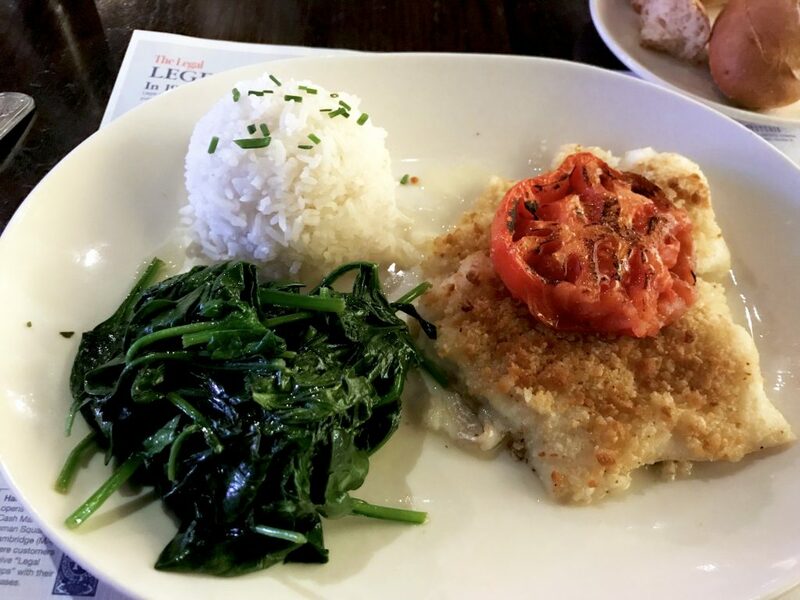 Legal Seafood is a wonderful celiac friendly chain restaurant! The waitstaff and managers are all well-trained to handle gluten allergies and celiac disease. The gluten free options are marked right on the menu and if you tell the server you have an allergy, the order gets flagged. The chefs use clean surfaces, new cutting boards and knives, fresh gloves, and separate fryers when preparing gluten free meals. The manager ensures the food is safe before bringing it to the table. This is a chain restaurant with gluten free options for every palate! They have everything from popcorn shrimp to steamed lobster all prepared safe and gluten free. They also have gluten free rolls. What more could you want? We all know how difficult it is to find safe gluten free Chinese food. For those days when you’re craving beef and broccoli without the risk of gluten, thank goodness for P.F. Chang’s. P.F. Chang’s is a celiac friendly chain restaurant that has a gluten free menu filled with Asian style favorites! They have a separate kitchen space just for gluten free orders and they bring the dishes out on special plates so you’re sure it’s safe. For take out orders, they label each box with an orange gluten free sticker. P.F. Chang’s has gluten free egg drop soup, chicken lettuce wraps, fried rice, and more! Not Your Average Joe’s is a celiac friendly chain restaurant with an extensive gluten free menu. They have AMAZING gluten free onion rolls that they serve hot out of the oven. Not Your Average Joe’s is super careful with gluten allergies and cross contamination. They have everything from salads to meat dishes to pasta– including a gluten free quesadilla (SO GOOD!) This a great chain restaurant for gluten free with kids too (they have a special gf menu just for the little ones). California Pizza Kitchen is an awesome chain restaurant for gluten free options. They have a special celiac friendly menu (make sure you specifically ask for the gluten free menu) that has several pizzas on it, including their famous BBQ chicken pizza. The ingredients for those pizzas are kept and handled in a totally separate area. They are prepared using the Gluten Intolerance Group (GIG) certified procedures so you know it’s safe. Important note: California Pizza Kitchen also marks items that use gluten free ingredients on their regular menu. These items are NOT safe for those with celiac disease as they are prepared in shared kitchen space. Only the pizzas on the separate gluten free menu are safe from cross contamination (pro tip: if you’re allergic to dairy, order the pizza with no cheese). Bonefish Grill is a celiac friendly chain restaurant that is very careful with all allergies. You can enjoy fresh fish, seafood, and more with their safe gluten free menu. They even have a flourless macadamia nut brownie sundae that is to die for! 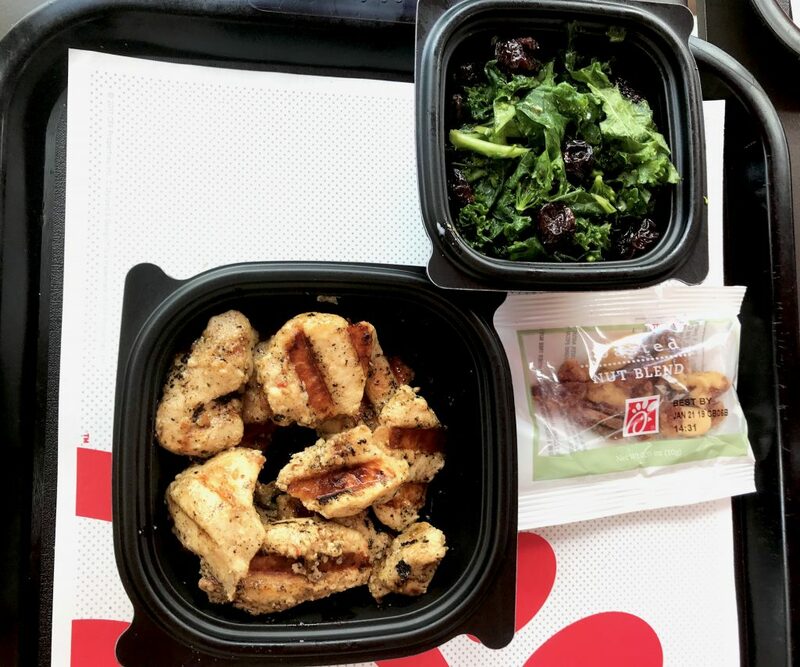 Chick-Fil-A is a great gluten free fast food restaurant option! The staff are well-trained in allergies and change their gloves when handling special orders. If you tell them you have celiac disease, they’ll flag your order with a red allergy stamp. You can enjoy grilled nuggets, waffle fries (they have a dedicated fryer), salads, and more. Many locations even have gluten free Udi’s buns kept in separate wrappers for sandwiches. This is one of my favorite chain restaurants for celiac because nearly everything they serve is already gluten free including the bread! Fogo de Chao is an all-you-can-eat brazillian steakhouse with incredible meat, salad, and cheesy portuguese bread! They’re very good with handling gluten allergies– just ask to speak to a manager. The manager will guide you through the process and give you a list of what you can/can’t eat. Only a few items contain gluten, such as the chicken legs (marinated in beer) and sausages, but always check with the manager for the full list. They even have gluten free dessert! Coastal Flats is a small chain (Maryland and Virginia) that offers a gluten free menu and safe preparation for allergies. This chain restaurant’s gluten free options include pasta, fresh fish, sandwiches, salads, and more! Hold the fries though– they’re on the gluten free menu, but they’re made in a shared fryer. If you let the server know you have a gluten allergy, he/she will alert the manager who will oversee the preparation of your food. Let them know you’re sensitive to cross contamination and they’ll take it seriously. This is also one of the few chain restaurants with gluten free breakfast options with brunch favorites like steak and eggs! If you’re craving a sub, Jersey Mike’s is the best for celiacs! They’re one of the most careful with gluten free of any fast food restaurant I’ve been to. Jersey Mike’s is a celiac friendly chain restaurant (counter service) that offers philly cheese steaks and much more on Udi’s gluten free bread! If you alert them of your allergy, they’ll clean all the counters and equipment plus change gloves before preparing your order. They’ll also sometimes prepare parts of your order in the back to keep it as safe as possible. The gluten free bread is kept in separate packaging until your food is prepared to ensure minimal cross contamination. Zoe’s Kitchen is a Greek counter service chain restaurant with gluten free options. The food here is safe, healthy, and delicious! 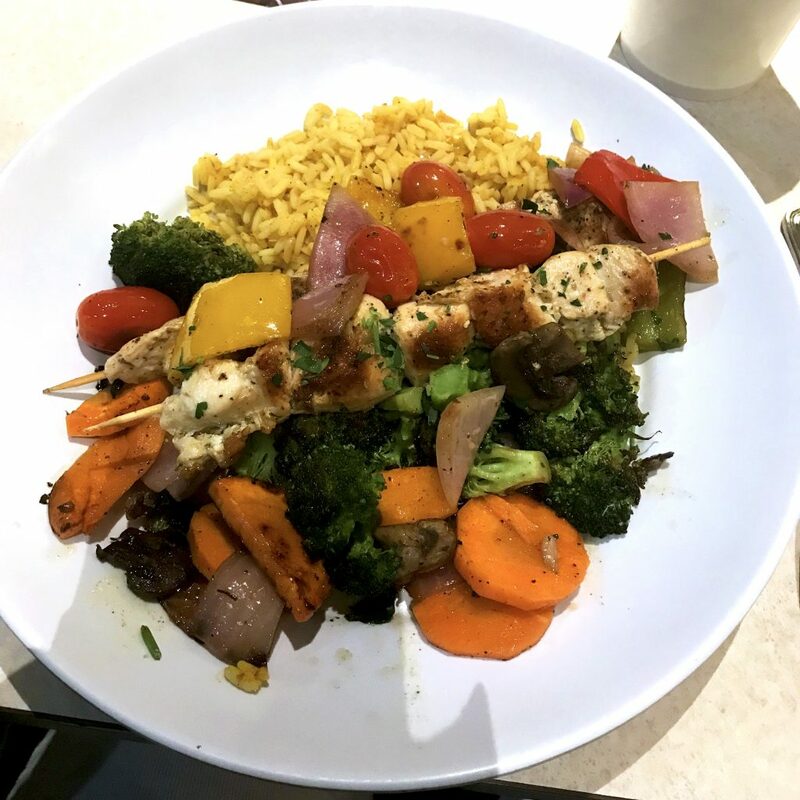 Zoe’s Kitchen has amazing salads, kabobs, and more with the gluten free options designated on the menu. If you have a gluten allergy, they will change their gloves and take extra precautions when preparing your food. They even have Whole30 options marked on the menu, if you’re feeling extra healthy! If you’re craving steak, Outback Steakhouse is an awesome chain restaurant with gluten free options for everyone! They take gluten allergies extremely seriously here by employing registered dieticians to work closely with the chefs and ensuring all the staff are well-trained. Outback Steakhouse has been serving gluten free items for over 10 years, so you know they can handle it! In addition to delicious gluten free steaks, salads, chicken, and seafood, they also have an amazing gluten free dessert called Chocolate Thunder From Down Under (once you get past the name, it’s actually super yummy ). If you want a safe celiac friendly chain restaurant experience, look no further than the Outback! Another awesome gluten free friendly restaurant chain! Olive Garden has a gluten free menu that includes pasta! Ask to speak to a manager and explain that you need the gluten free pasta cooked in fresh, separate water to ensure it’s not cross contaminated. If you tell them you have an allergy, they will work with you to make sure it’s safe. And yes, their famous salad can be safely prepared gluten free without the croutons! This is one of a few safe gluten free pizza chains in the USA. It’s one of those gluten free friendly fast food restaurants where you choose unlimited toppings and they bake the pizza right in front of you. If you tell them you have a gluten allergy, they will change their gloves and use a separate cutter for your pizza. They also put the pizza on a separate baking tray, so it doesn’t come into contact with the oven. While Blaze Pizza does take every precaution necessary and I’ve always had a good experience there, if you’re SUPER sensitive please be aware that they do use a shared oven and there is flour on the premises. This is a great chain restaurant for gluten free. It’s a fast casual Mexican restaurant (similar to Chipotle) with burrito bowls, tacos, salads, and more. If you alert them of your allergy, they will change their gloves and a manager will check your food. Most of the burritos are gluten free if ordered as a burrito bowl and the tacos are gluten free with corn tortillas (they warm the corn tortillas on a separate part of the grill away from the flour ones). Just watch out for the chips– they’re fried in shared oil. Seasons 52 is one of the best chain restaurants for celiacs. They have a separate gluten free menu and take cross contamination very seriously. Seasons 52 is a nice gluten free sit down restaurant with delicious dishes, such as filet mignon, chilean sea bass, and more! It’s a perfect gluten free friendly restaurant chain for a special occasion like a birthday or anniversary. They change the menu seasonally, so the food is always fresh and you’ll never get bored! They also have separate menus for vegan, dairy free, and other special diets. Five Guys is one of the best fast food chain restaurants for gluten free, if you’re craving a burger. They can put any burger and topping combination into a lettuce wrap or bowl for a bun-free experience. If you tell them you’re allergic to gluten, they will change their gloves and clean the surfaces. Their fries are also safe for celiacs (dedicated fryer) but they are fried in peanut oil, so be aware if you have a nut allergy. This is a great gluten free fast food restaurant for BBQ! Gluten free BBQ is really hard to come by with hidden gluten in the sauces (specifically malt vinegar). At Mission BBQ, celiacs can rest easy knowing that all the allergens and ingredients are listed in every sauce. 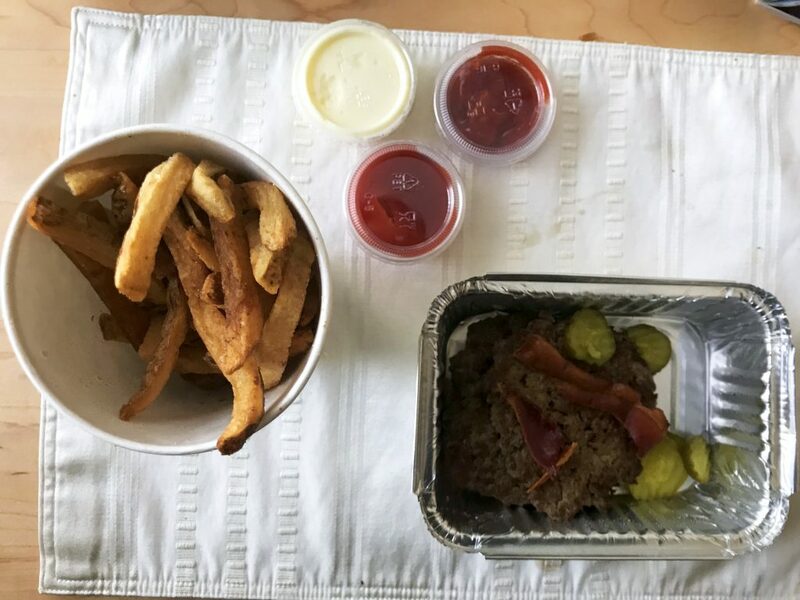 All the meats are gluten free and all of the sauces, except for Texas Twang and Gator Bite (make sure you consult their allergens list for the most up-to-date info). My personal favorite sauces are the Alabama White and the Tupelo Honey. You can check their website beforehand or ask an employee for an allergens list. When you order your food, tell them you have a gluten allergy– they’ll will change their gloves and leave the cornbread off your plate. Another delicious gluten free chain pizza restaurant. Unlike Blaze (#13) and Pieology (#21), this is a sit down gluten free friendly chain restaurant, so it’s great for birthdays, weekends, or a night out with the kids. Mellow Mushroom is the safest gluten free pizza chain for celiacs because they have a dedicated kitchen space, utensils, and bins that only gluten free toppings are used for. They even have vegan cheese for those who are dairy free! The Melting Pot is a celiac friendly chain restaurant that serves fondue! They offer a delicious 4 course menu that includes cheese fondue, salad, an entree where you cook meat and veggies right in the fondue pot, and of course CHOCOLATE fondue to end the meal. If you tell your waiter about your allergy, they will work with the kitchen and management to ensure your food is safe from cross contamination. They’re very accomodating and remove ingredients like beer and worcestershire sauce where necessary to ensure your food is gluten free. The Melting Pot is a great option for a special night out! Red Robin is a super celiac friendly chain restaurant for burgers, sandwiches, and more. They take gluten allergies and cross contamination very seriously here. If you order a gluten free meal, the manager will bring out your food in a yellow “allergen” basket instead of a red “regular” basket. They even offer gluten free buns! Pieology is a gluten free fast food restaurant similar to Blaze Pizza. They offer gluten free pizza dough with unlimited toppings and bake it right in front of you. Like Blaze, Pieology takes every precaution they can (changing gloves, separate baking tray, separate cutter), but it’s still a shared kitchen space with the presence of flour. The gluten free dough here is delicious– chewy on the inside and crispy on the outside. YUM! Another celiac friendly chain restaurant (counter service) similar to Five Guys, but with a more extensive menu. They have everything here from truffle mayonnaise (fancy!) to fried brussels sprouts (cooked in a dedicated fryer!) If you tell them you have a gluten allergy, they’ll flag your order and take the proper precautions of cleaning the surfaces and changing gloves. They do have a dedicated fryer, so fried food should be safe here, but always check with the individual location to be sure. Pei Wei is a celiac friendly chain restaurant (counter service) that is run by P.F. Chang’s. 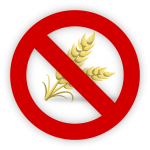 The gluten free menu and procedures for handling allergies are similar to P.F. Chang’s, but the food is cheaper and faster! A great gluten free fast food restaurant option when you’re in a hurry! Wildfire is a small chain with locations in Illinois, Minnesota, and Virginia. If you’re lucky enough to be in a state that has Wildfire, you can enjoy safe gluten free steak, pizza, salad, fish, and more! They have an extensive gluten free menu and are committed to preparing the dishes safely. All the staff are well-trained in handling allergies. 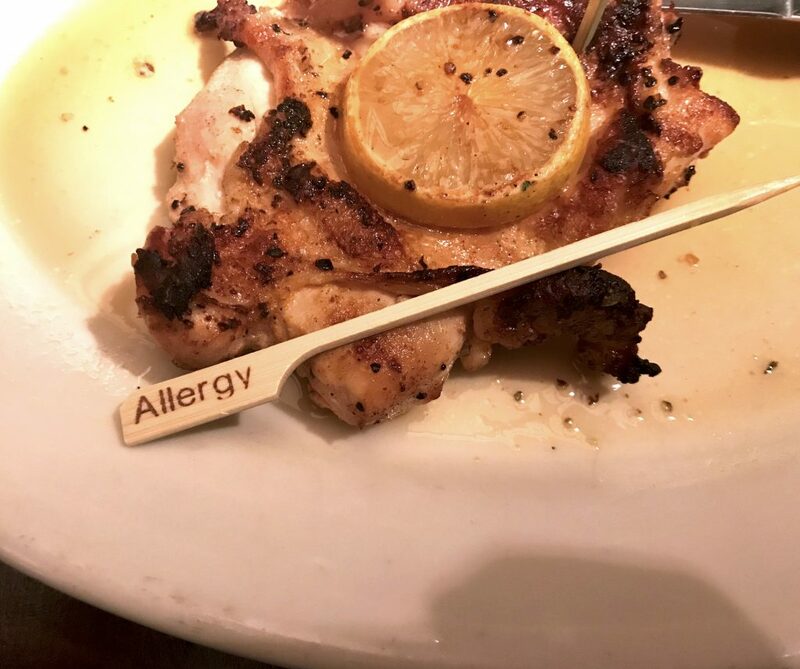 The gluten free dishes come out with wooden allergy sticks, so you know they’re safe. You can rest easy at this delicious celiac friendly chain restaurant– it’s all taken care of! Plus, there’s a delicious gluten free bread basket at the start of the meal! Believe it or not, Benihana is an awesome gluten free friendly restaurant chain. They have a gluten free menu (you can check it out on their website) and a system for handling allergies. If you tell them you have a gluten allergy, they’ll prepare your food in the back (not as much fun as seeing it on the hibachi grill, but MUCH safer). They’ll also give you miso soup instead of the regular onion soup, which contains gluten. You can still enjoy the hibachi show and watch everyone else’s food get cooked knowing that your food is being safely handled in the kitchen. They even have gluten free soy sauce! Benihana is the most celiac friendly chain restaurant for hibachi hands down. I hope you found some new gluten free friendly chain restaurants for your next meal out! While eating out at any restaurant that handles gluten can be a risk for celiacs, these restaurants do the best they can to ensure you’ll have a safe and delicious experience. Just remember to always speak to your waiter and/or a manager about your individual needs, so they can accomodate you. Never assume anything is safe without speaking to someone at the restaurant. This list of 25 celiac friendly chain restaurants takes the guesswork out of eating out, so you can enjoy your meal worry-free knowing you’re being taken care of. I know first hand that when you have a serious allergy knowing you’re safe is the BEST feeling! Hope you enjoy and that these celiac friendly chain restaurants help you dine out with more confidence! Have you eaten at one of these celiac friendly chain restaurants recently? What was your experience like? Share with us in the comments below and help me keep this post up-to-date! Whether your experience was good or bad, I want to know about it so we can help keep others safe! Thanks for your help!